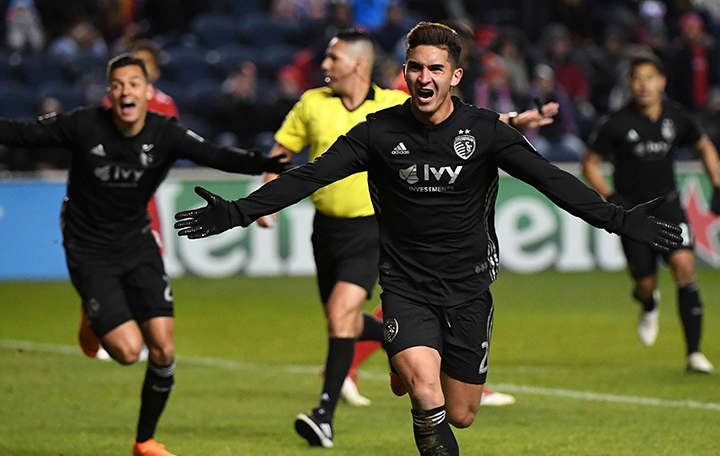 Sporting KC’s stud goal scorer Felipe Gutierrez recently had sports hernia surgery that will leave him out of competition for 2-3 months. In the grand scheme of sports injuries, this really is a blip on the map. He should be back in no time dominating on the pitch again. Sports requiring repetitive, high velocity twisting and cutting are at greatest risk (Unversagt et al, JOSPT 2008) and it is more common in men than women. Therefore, Felipe Gutierrez is at high risk for it as a professional soccer player. “Hernia” is really a misnomer though because there is no hernia on exam or imaging, so a definitive diagnosis is difficult. ESPN even did a feature on this injury on “Outside the Lines” a few years ago. So what’s the deal with this injury? Unfortunately, sports hernia is poorly defined and has a number of terms that are associated with it. “Athletic pubalgia” is a term that is often used interchangeably with sports hernia and it essentially just means a collection of vague symptoms in the pubic/groin region, but the physical exam is often inconclusive and the cause is not identified (Kachingwe, Grech JOSPT 2008). It may or may not involve muscles of the hip and/or the groin and abdominal muscles. It is very different though than an inguinal hernia, which is basically protrusion of abdominal contents through the inguinal wall (this is what the doctor is testing for when he/she asks males to “turn and cough” during a physical exam). The hallmark sign is severe abdominal, pubic, or groin pain with exertion that is relieved with rest (Kachingwe & Grech). It is usually associated with sudden onset of groin pain. Pain is deeper and more intense than typical muscle strains. Coughing, sneezing, straining, and sitting up from lying are often pain provoking. Previous authors have reported five predictive signs/symptoms of sports hernia: deep groin and/or abdominal pain, pain exacerbated by sports activities, palpable tenderness in the groin region, and pain with sitting up and resisted adduction (Ahumada et al, Diaco et al, Ingoldby et al, Meyers et al, van Veen et al). In our experience, many athletes report that they struggle to reach top speed when they sprint and feel that their leg is “heavy.” In addition, many of our athletes that have sports hernia have a long history of groin and hip flexor strains that may or may not have been rehabbed entirely. Many athletes with those injuries rehab those to get “good enough” during the season and fail to fully rehabilitate them. Therefore, they’re at risk for repetitive muscle strains. Because of the tremendous torque that occurs across the hips and groin during sports activities, there is basically a “tug of war” where the abdominals attach and where the hip muscles attach. If one of those muscles weaken, the opposing muscle often overpowers the weaker muscles. There is a resultant inequality of forces on the pelvis, leading to the symptoms. Another proposed mechanism is shearing forces across the pelvis with planting, cutting, and kicking (Anderson et al, AJSM 2001). 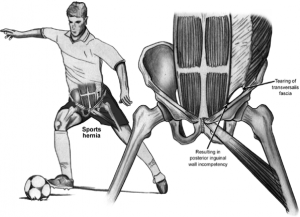 Physical therapy after sports hernia surgery is relatively uneventful. The first 10 days is relative rest – just doing activities of daily living and lots of walking to let tissues heal. After this initial 10-14 day period, easy stretching of the hips and abdominal isometrics are initiated. Once the incisions heal adequately, pool exercises can be used as an adjunct to activity. Then, a progressive hip, core, and lower extremity strengthening program commences. At SSOR, we try and restore those chronic imbalances that lead to the injury in the first place. Once flexibility has been restored and strength tests are passed without pain, the athlete can begin a running program and eventually, back to sports activities. Most athletes are back anywhere from 6-12 weeks. One important caveat – many athletes report after surgery that they feel exactly the same as prior to surgery for a number of weeks. This is quite a common complaint and this will resolve over time. So athletes, don’t step off the ledge – you’ll be fine!! If you have sports hernia surgery and need rehab after, look no further than our team of skilled sports physical therapists. We’ve treated professional athletes and “average Joe’s” alike here for it. We’re confident we can help you. It would be a privilege to partner with you in your care, give us a call!